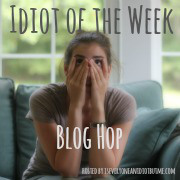 So one blog I really enjoy reading, for obvious reasons, is Is Everyone An Idiot But Me? It is admittedly annoying that someone came up with that before I had a chance, but I swear I was just about to do something like that right before this thought-stealing woman snatched it. Anyway, I digress. In what can only be described as a once-in-a-lifetime opportunity, I have a chance to spout off about an idiot or idiots and win a super valuable prize of some kind. It’s a Blog Hop. Language-Manglers. We all know them. Some of you might even be them. People who think they know a word, but either use it incorrectly, mispronounce it, invent a past tense, or make it up altogether. Here are some of my favorites, used in a sentence. Agreeance: We’re all in agreeance then. Irregardless: Irregardless of what you do, I’m going to continue my education. On Tomorrow: I am going to call you on tomorrow. I*: Why don’t you come with Jane and I? Me*: Jane and me are going to get ice cream. Raisin Debt: My life’s work as a writer is my raisin debt. Literally*: I was literally over the moon. Half*: I half to go to work tomorrow (only correct if you are a Jewish man over the age of 80). Misnomer*: I think everyone has a misnomer of what that really means. Hypocritical*: Let me give you a hypocritical of how it might happen. Humidified*: When I realized my skirt was tucked into my pantyhose, I was humidified. Ironic*: It’s so ironic; I got a flat tire on the way to my wedding. Fat: No, I’m not pregnant, just fat. Agreement: We’re all in agreement then. Regardless: Regardless of what you do, I’m going to continue my education. Tomorrow: I am going to call you tomorrow. Me: Why don’t you come with Jane and me? I: Jane and I are going to get ice cream. Raison d’être: My life’s work as a writer is my raison d’être. Have: I have to go to work tomorrow. Scratch: I have an itch so I need to scratch myself. Misunderstanding: I think everyone has a misunderstanding of what that really means. Hypothetical: Let me give you a hypothetical of how it might happen. Humiliated: When I realized my skirt was tucked into my pantyhose, I was humiliated. Unfortunate: It’s so unfortunate; I got a flat tire on the way to my wedding. It’s misfortunate that so many people butcher the language, but hopefully my post will learn them something. This entry was posted in Uncategorized and tagged Blogging, Culture. Bookmark the permalink. One of my favorites is the medium in the middle of the road. I always thought it was a median but the thought of a psychic directing traffic is much more fun. Very funny post! Yes! It just begs the question, why did the medium cross the road? Come to Central Pennsylvania and listen to how language is butchered. e.g., Him and me think our truck needs fixed but first we need to take little Jenny to the liberry to look something up in the pictionary. Also, check out people’s comments on sports blogs. And have you noticed some of the howlers on the stuff crawling across the bottom of your TV screen during news programs? Myrna-a true respect for the language–one of so many reasons I love you! Now don’t all y’all go nuculear, them’s just dialectical varegations. And we haint even gotten to the influenza of texting and twittering and ekcetera. I can see I need to start moderating comments again. I was laughing so hard I had to lay down. I’m sorry I stole your idea haha. This was perfect! I haaaate when people misuse words like that, I want to correct them, but I don’t want to be that annoying jerk who goes around correcting people’s grammar, saying, “I think you meant, fewer, not less!” In high school I had a teacher who said “for all intensive purposes” instead of “for all intents and purposes” and it drove me insane. Thank you for joining the Blog Hop. I am going to have it up each week so if by chance, somehow, you come across another idiot in the next week… feel free to join again!